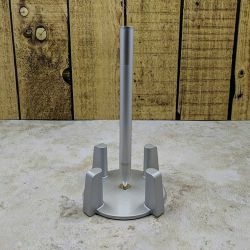 More and more, the smallest devices we have are connected to the internet; the days of a 4 port router being useful are long gone. 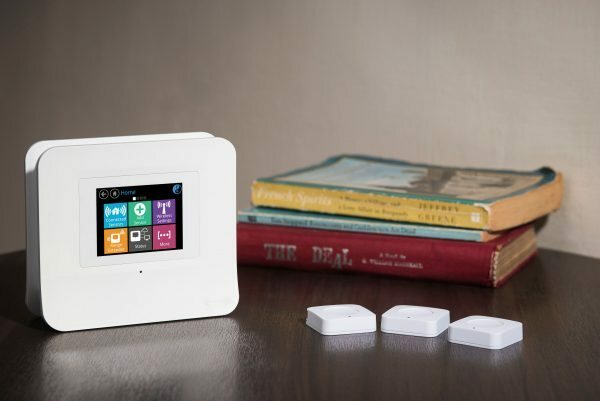 Nowadays, many of us need Wi-Fi capable of providing a signal to dozens of devices, throughout our homes. Some people find themselves with a great signal on one side of the house, while finding themselves without a signal on the other side. Others find themselves with a good signal on one floor, while having a poor signal on another. I hardly live in a palatial estate, and find my Wi-Fi signal barely extends past the walls of my home. If I’m outside my house, I find my phone jumping back and forth between Wi-Fi and mobile data. 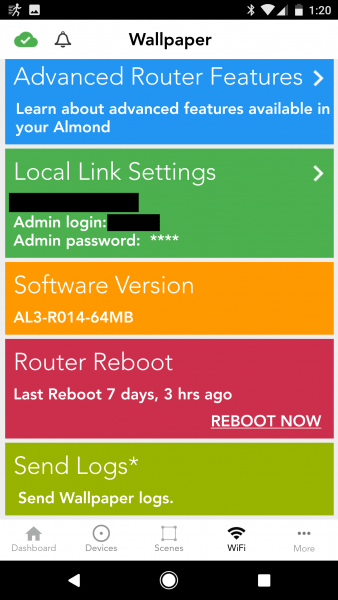 One solution is to get a range extender; however, most take your original network name and add an “_EXT” to it (i.e. 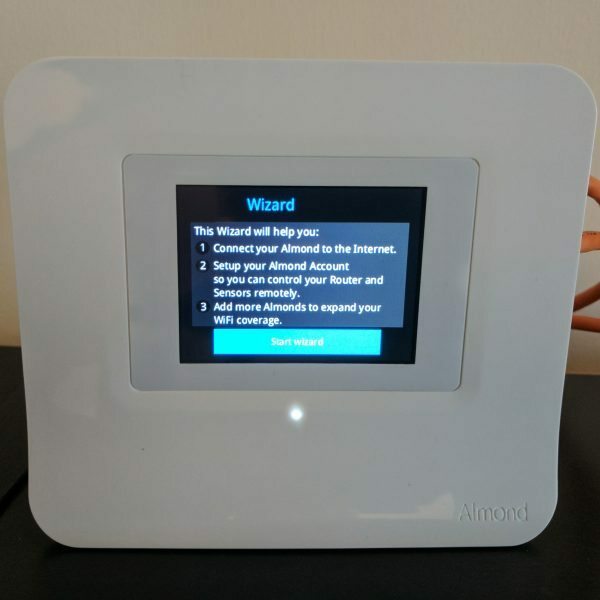 Home_Network becomes Home_Network_EXT). This results in two separate networks for your devices to connect to. 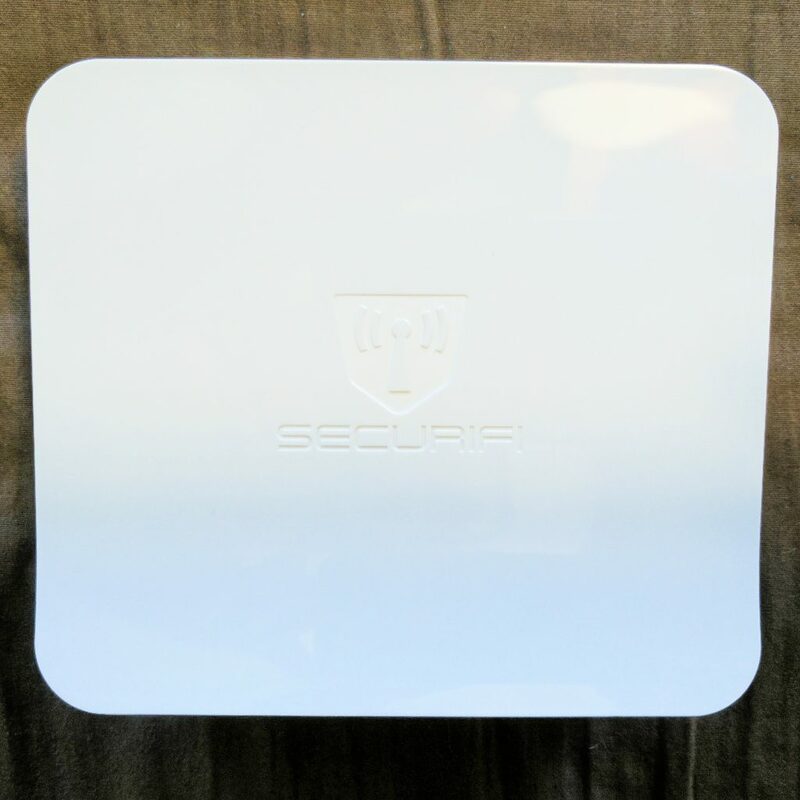 Recently, I’ve been exploring the concept of a wireless mesh network. 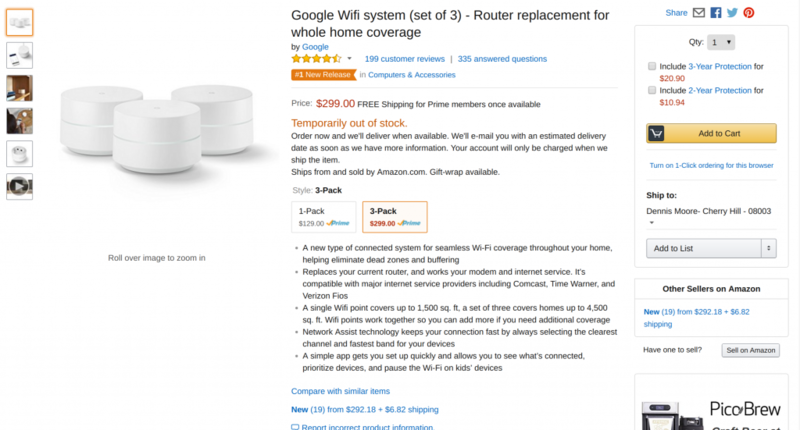 The concept is somewhat similar to range extenders; however, each router uses the same network name. 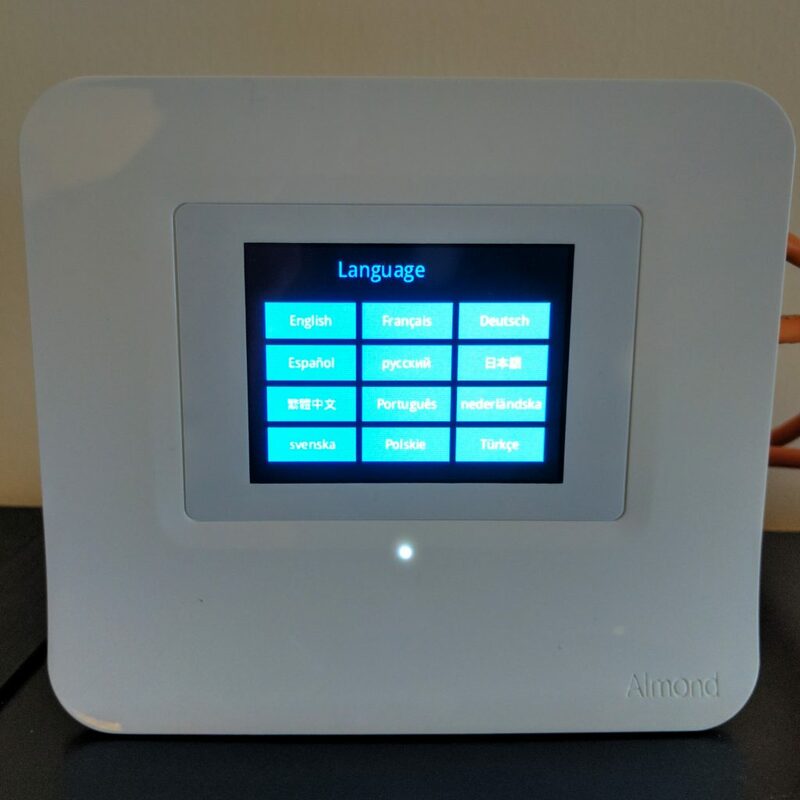 While doing my research, I was offered the chance to review the Securifi Almond 3 smart home WiFi router. Not only is it capable of creating a mesh network, it also has several smart hub capabilities. Immediately upon opening the box, you can see the Almond 3 routers are different. 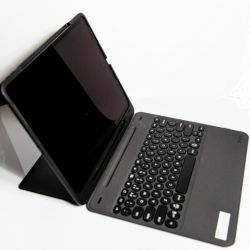 Rather than looking like a traditional router, they look like tablets with tiny screens. Each of the three routers is identical. 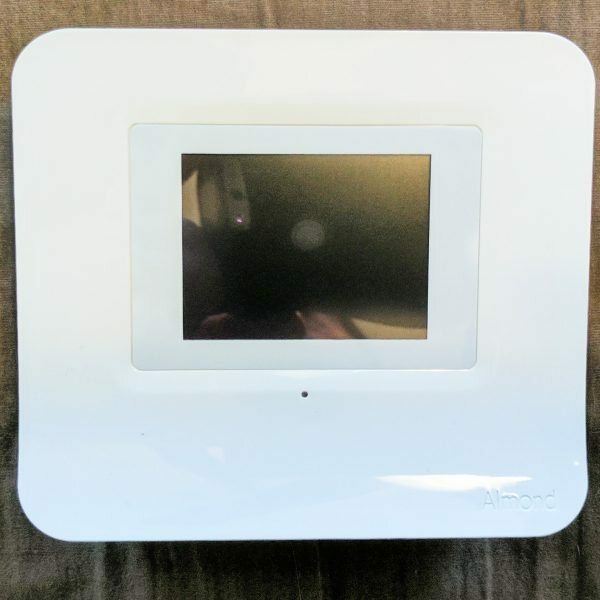 The front of the router holds a touchscreen LCD color display, with an LED just below. The back of the router has nothing other than minor branding. 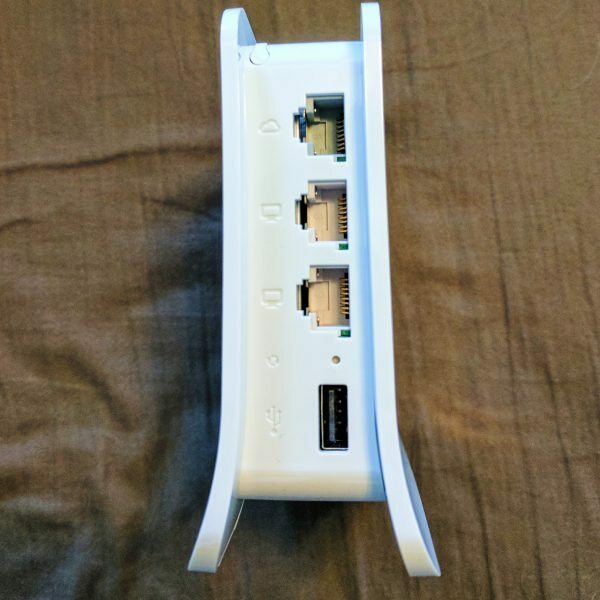 The side of the router holds one WAN port, two LAN ports, a USB port, a reset button, and a stylus. 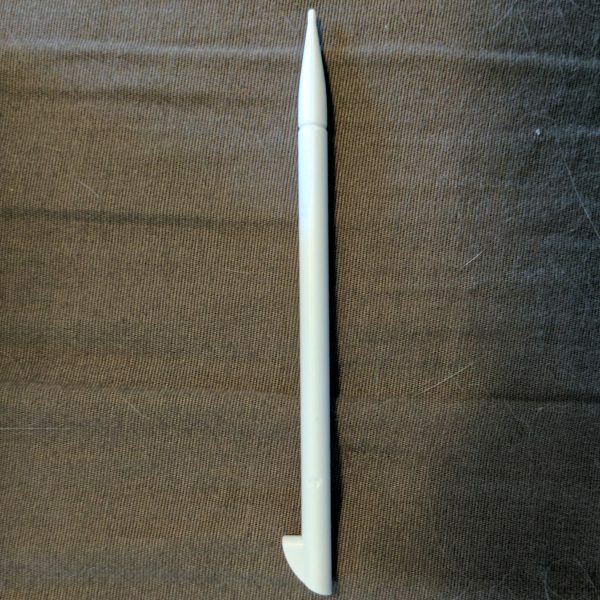 The stylus slides out from the top and can be used on the touchscreen. 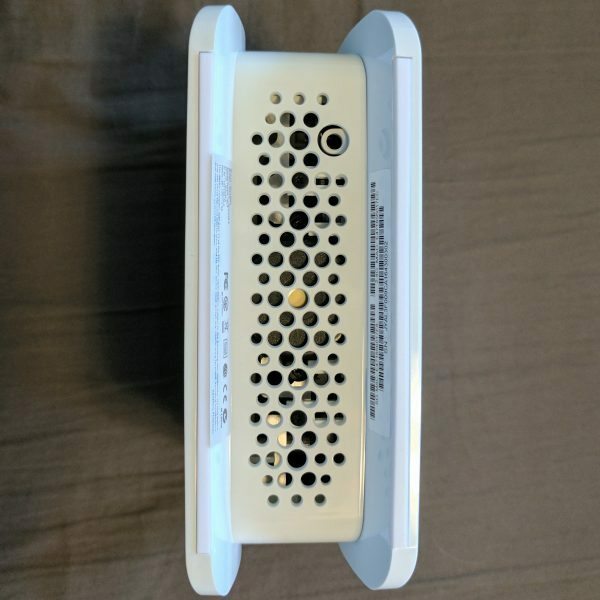 The A/C adapter port is located in the top right, underside of the router. That’s really all there is to the design of the Almond. It’s a simplistic design that allows the router to blend into the background. 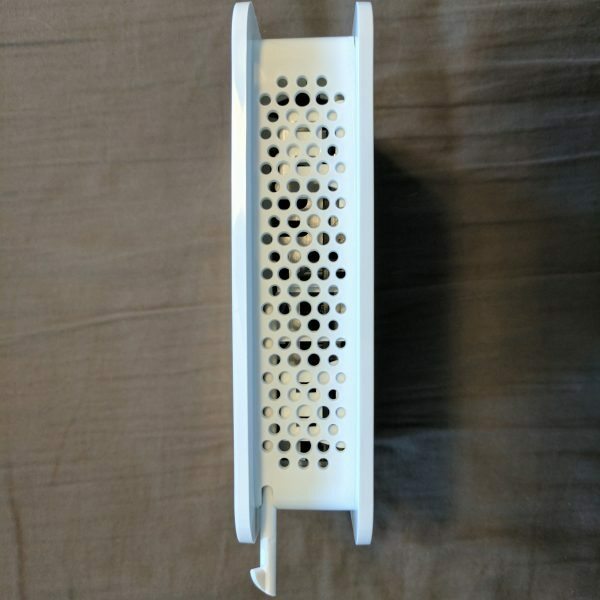 You could easily “hide” the router on a bookcase or an entertainment center. 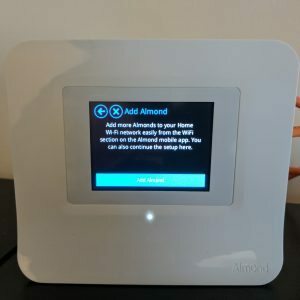 While the Almond has many features, the Mesh Network feature was the one I was most excited about and most eager to test. 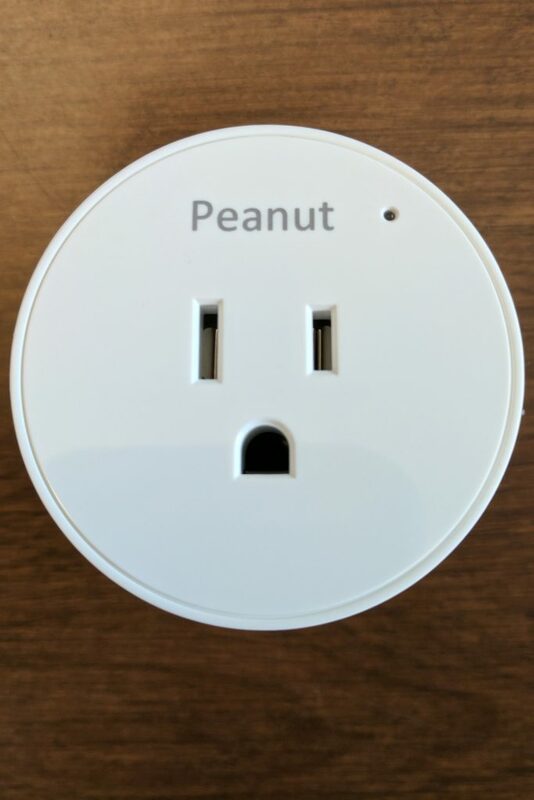 I powered up the first router and was immediately faced with a concern. The router takes an unusually long time to boot up. I took so long I actually began to worry it had froze. Once the Almond is fully powered up, you choose your language. Next, you begin a fourteen step process to set up the mesh network. 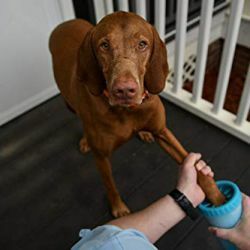 The process isn’t very complicated and is overseen by a setup wizard. 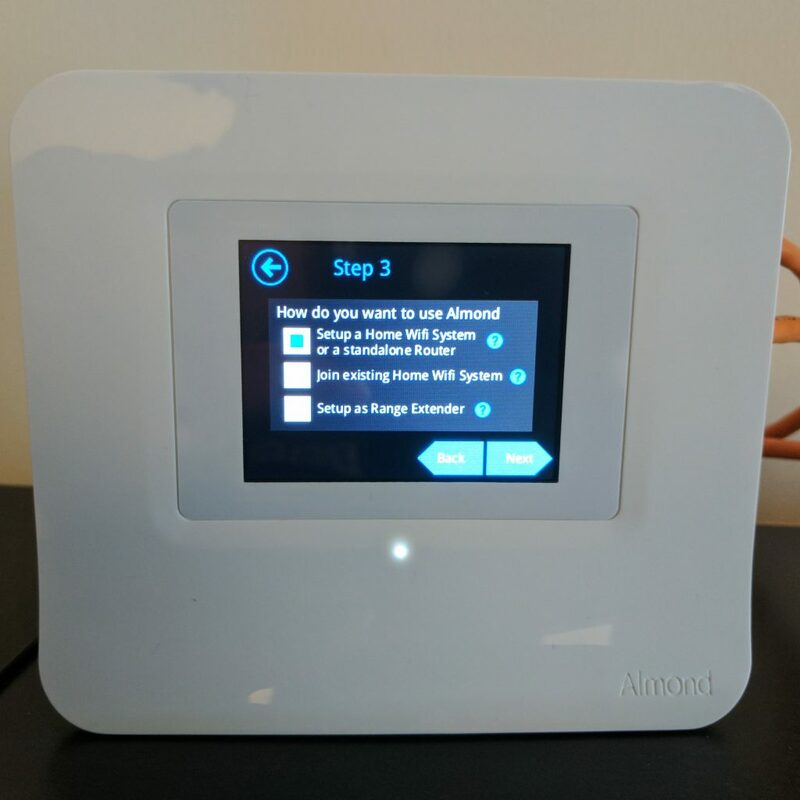 The process includes selecting the router’s location, selecting the network type, and creating an Almond account. After setting up the initial router, you are asked if you want to add additional Almonds. This is another multi-step process. 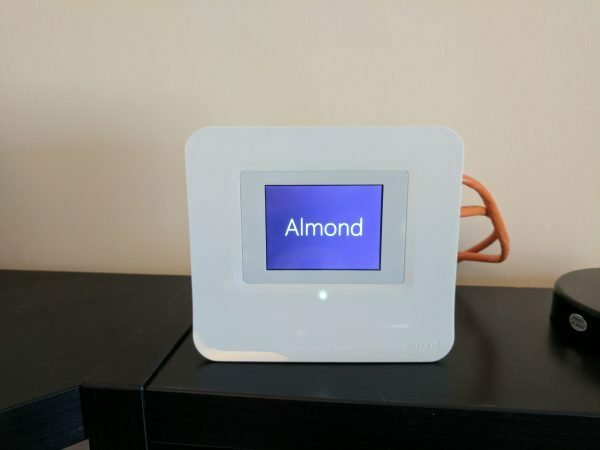 You choose how you want the additional routers connected, what Almond to connect to, and the location of the new Almond. You also have to run back and forth between the new and original Almond to confirm they are connected. It’s not a difficult process, but it is time-consuming. Depending how far apart your routers are placed, you may break a sweat running back and forth between the three. After getting all three Almonds set up and connected, I needed to change my network name. During the setup process, I was never given the chance to chose a name and the Almond gives you a generic name. I have dozens of gadgets connected to Wi-Fi and I assumed it would be easier to change the network name on the routers, rather than update the connection information on all my devices…. I was wrong. Changing the network name on the first router was easy enough, you can do it from the Almond App or directly from the router. The problem occurred with the two secondary routers. That’s the message I kept receiving when trying to update the network name for the secondary routers. I spent a good amount of time trying to resolve the issue on my own, but was unsuccessful. 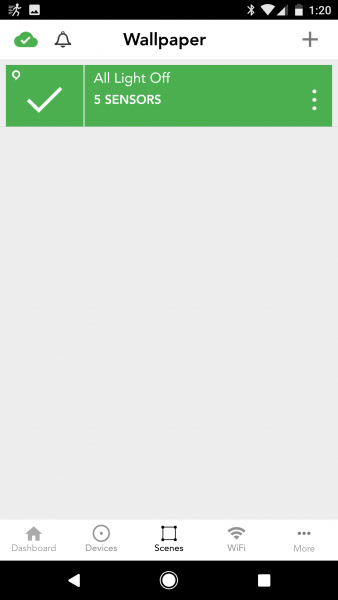 Eventually I had to contact Securifi support. Tech support was able to resolve the issue, but the process took forever for several reasons. First, I had to keep running from one room to another to give information from each router. 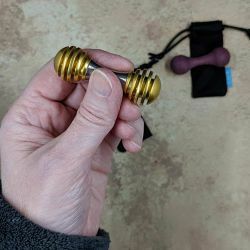 I literally began to work up a sweat. Second, I had to reboot the routers and as I previously stated, the boot time is unusually long. Finally, the routers wouldn’t update their firmware properly. 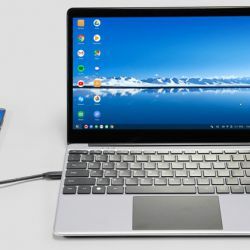 The tech agent advised he could force a firmware update, but I would need to install a program and he would need to take control of my laptop remotely. I was a bit unnerved by this, but in the end, the agent was able to get the routers working. I’ve never set up a mesh network before, but can’t imagine it’s normal for it to be so labor intensive. The initial setup wasn’t awful, but it takes approximately thirty steps and several laps around the house to get all three routers up and running. That’s not including the troubles I had changing the network name. 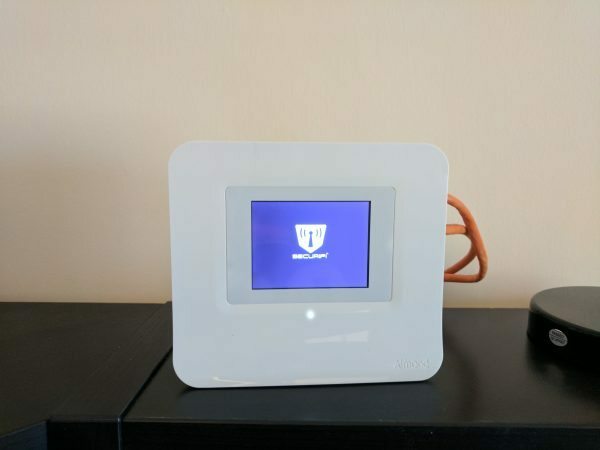 In my opinion, Securifi needs to simplify the setup process. Prior to reviewing the Almond 3, I had been using a T-Mobile Cellspot router. 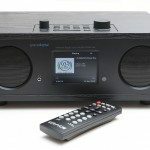 The Cellspot is a rebranded Asus RT-AC68U that’s been well reviewed in the past. While its signal doesn’t cover my entire property, I’ve never had issues with the covered area. 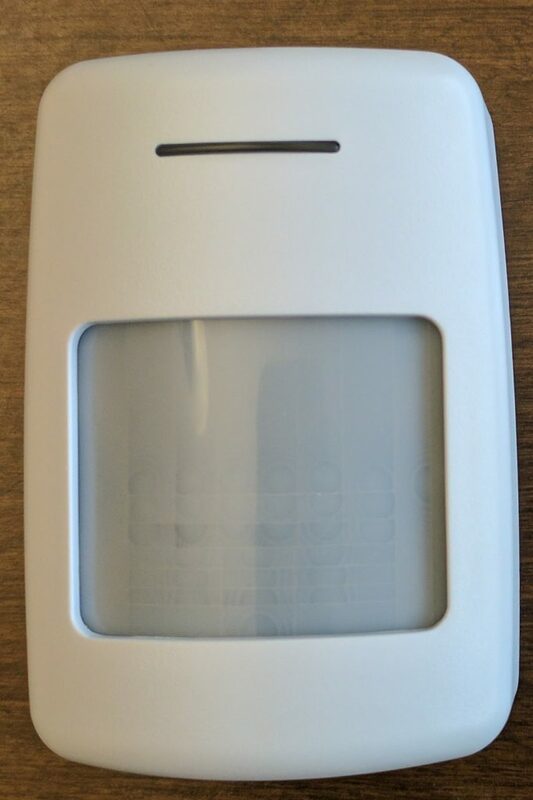 In the several years, I’ve been using it, I don’t think I’ve ever had a bad signal. After using the Almond for several weeks, I find myself somewhat ambivalent towards its performance. There are several reasons for this. First, it didn’t increase or decrease the coverage in my home. I’m sure the coverage wasn’t identical, but whatever increase/decrease occurred wasn’t noticeable. Second, I didn’t notice any long-term performance issues, but there were several times when my internet stopped working. 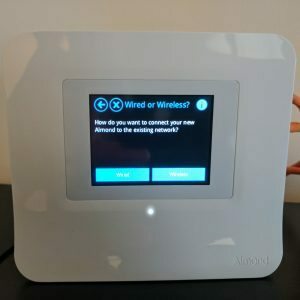 Whatever device I was using at the time would show that I was connected to my Wi-Fi network, but no data was being transmitted. The outages weren’t long at all, only a handful of minutes at most. It’s entirely possible it may have been a provider issue, but I don’t recall this ever occurring with my other router. One nice feature of the Almond is the ability to monitor activity with the Almond App. The App can be downloaded for Android and iOS. 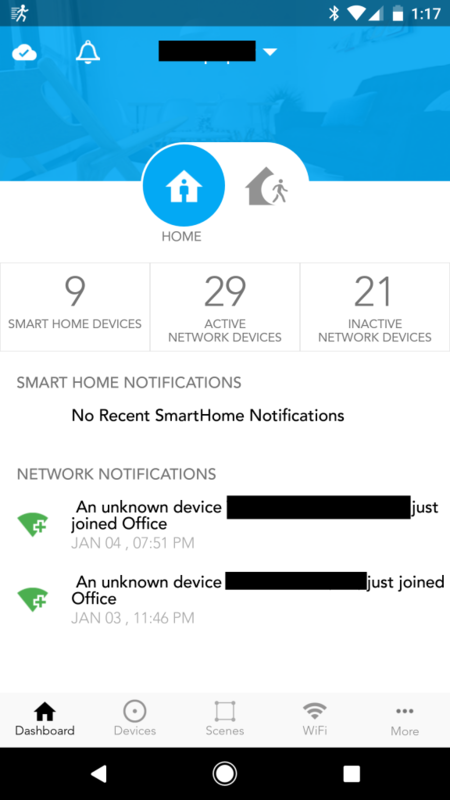 The app allows you to see how many active and inactive devices are connected to your network. 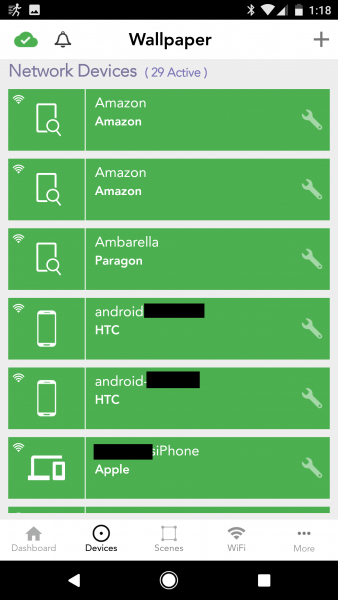 You can also see the names and types of devices connected to the network. The app also allows you to change network settings; however, I didn’t try any of these features after the difficulty with changing my network name. For the most part, the Almond 3 functioned just as well as my Cellspot router; it just never did anything to blow me away. Along with being a Wi-Fi router, the Almond 3 is also a capable smart hub. 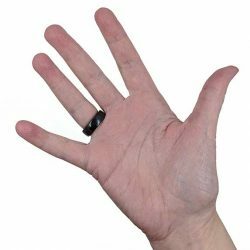 Right out of the box the Almond supports the ZigBee protocol, but it can also support Z-Wave with the purchase of a Z-Wave USB dongle. 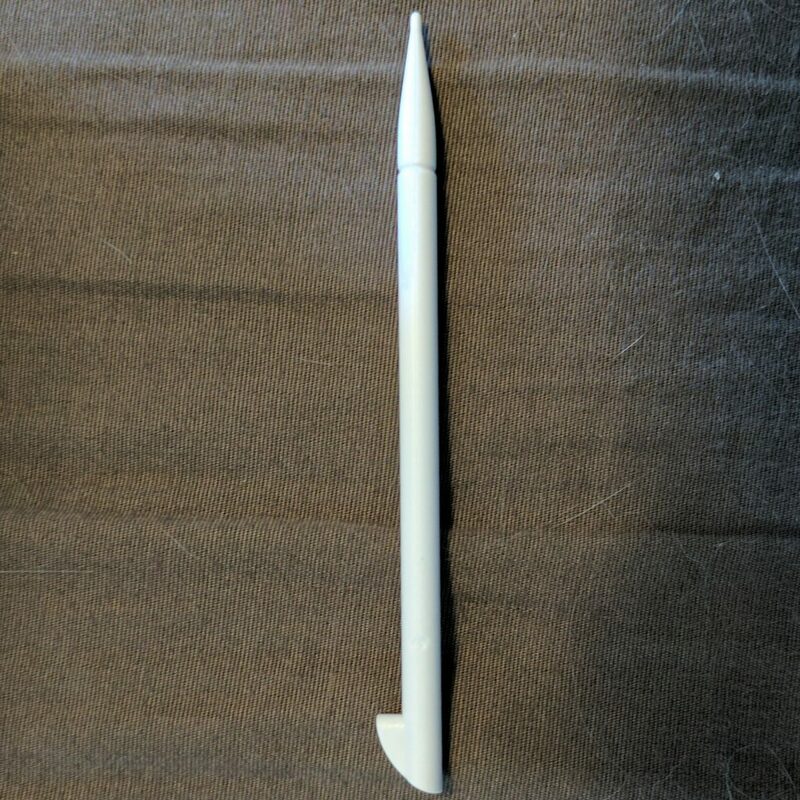 Additionally, the Almond has a siren built into it. 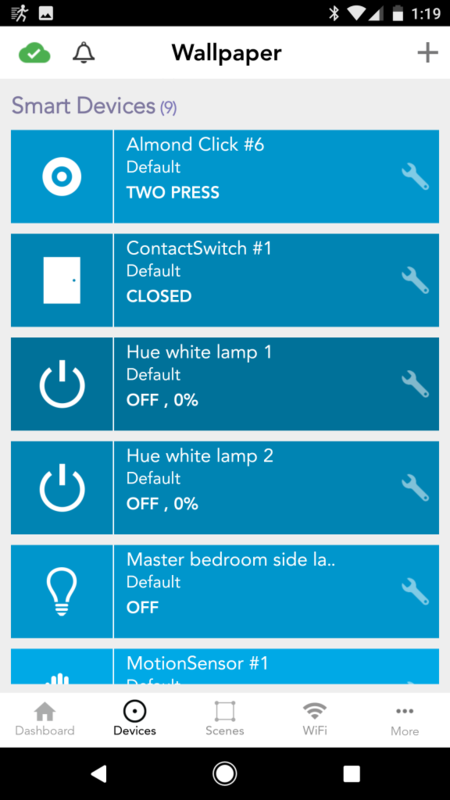 All of the above items came pre-paired with my Almond, so I can’t say how easy or difficult it is to pair them; however, I was able to pair my Philips Hue with the Almond. This was extremely easy to do. 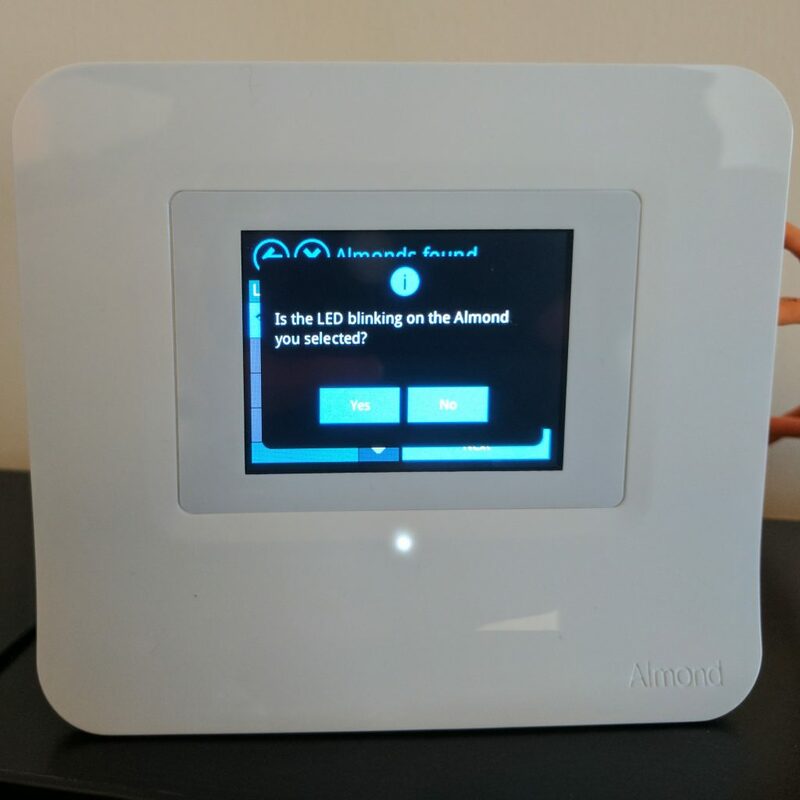 You simply press “Add Sensors” on your primary Almond, click “Add Hue”, then follow the instructions on the Almond. It literally took seconds. 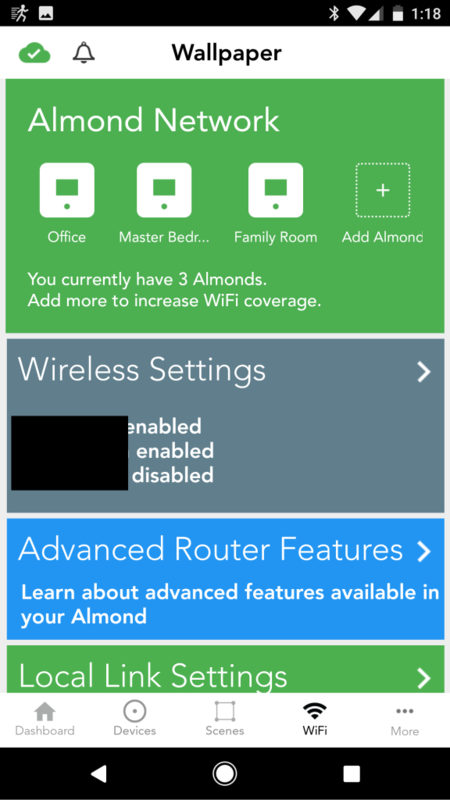 Once all the devices you want to use are connected to the Almond, you can use the Almond App to control them. 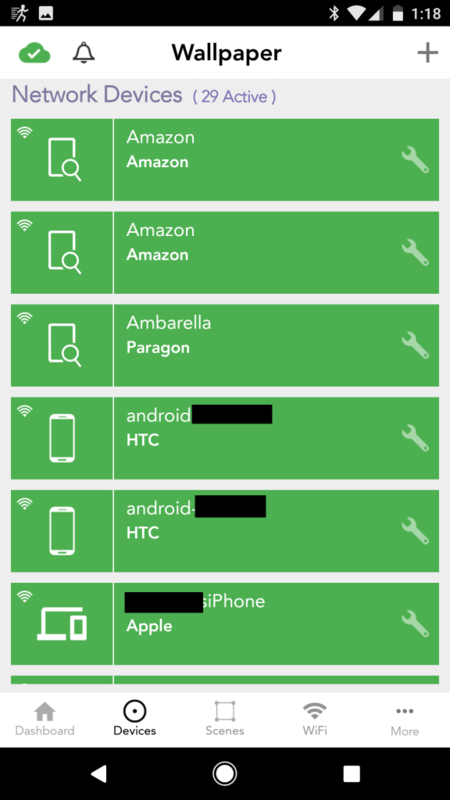 The app lists the number of connected devices and their current status. For devices like Hue lights and smart plugs, touching the icon on the left will toggle them on and off. 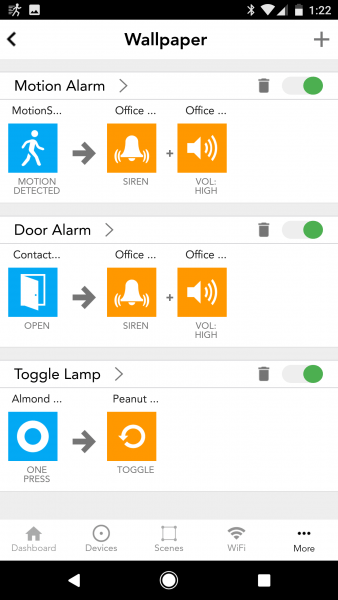 The app also allows you to create scenes and rules for connected devices. 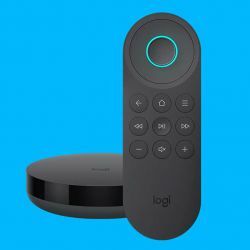 Scenes allow you to control multiple devices with one command. 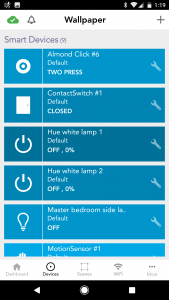 For example, I created a scene “All Light Off” which turns off all connected lights and toggles off the connected smart plug. 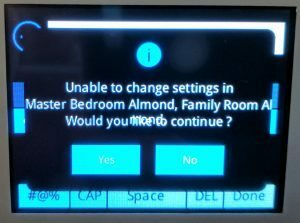 If you have an Amazon Echo, you can enable its Almond skill and say “Alexa, tell Almond, All Light Off”. 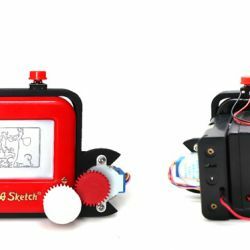 This worked well and should work with any scene you create. 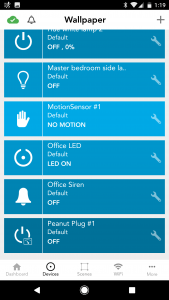 Rules allow you to create if-then statements to control devices. 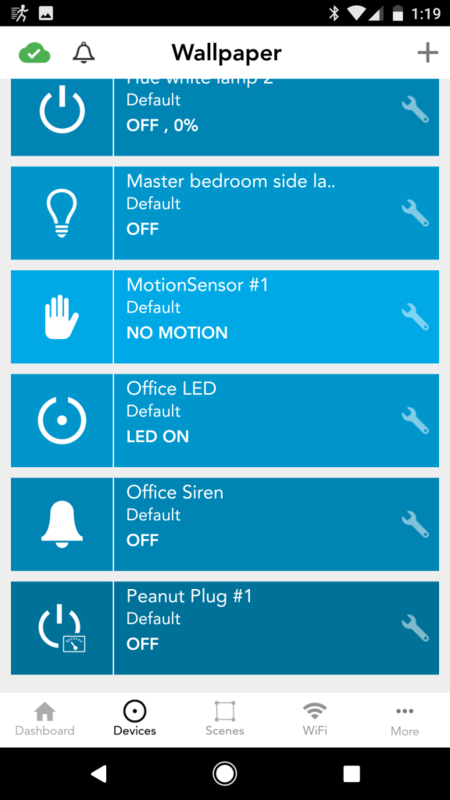 I created two that would turn on the siren if motion was detected or the door sensor was open. 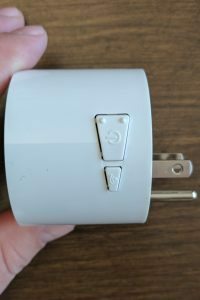 I also created a rule that toggles my smart plug on/off when the Almond click is pressed. 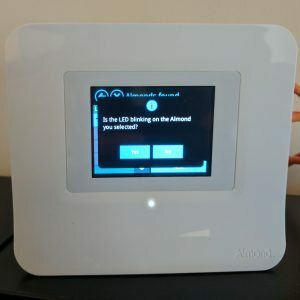 All in all, the Almond is a pretty capable Smart Home hub; although, it would be nice if you didn’t need an extra dongle to enable Z-Wave. 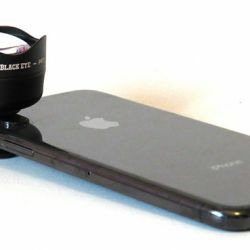 For many people, the most important “spec” on any device is the cost. For $399.99 you can get three Almond 3 routers. While there may be some initial sticker shock, you have to consider the Almond 3 is both a Wi-Fi mesh network router and a smart hub. 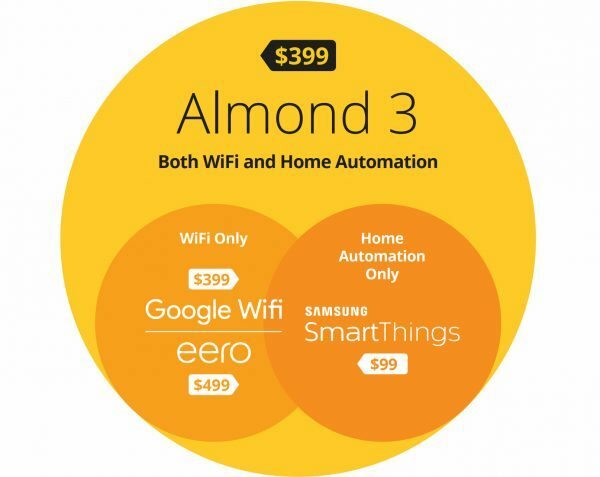 Looking at the infographic, it seems like the Almond 3 is an exceptional deal. 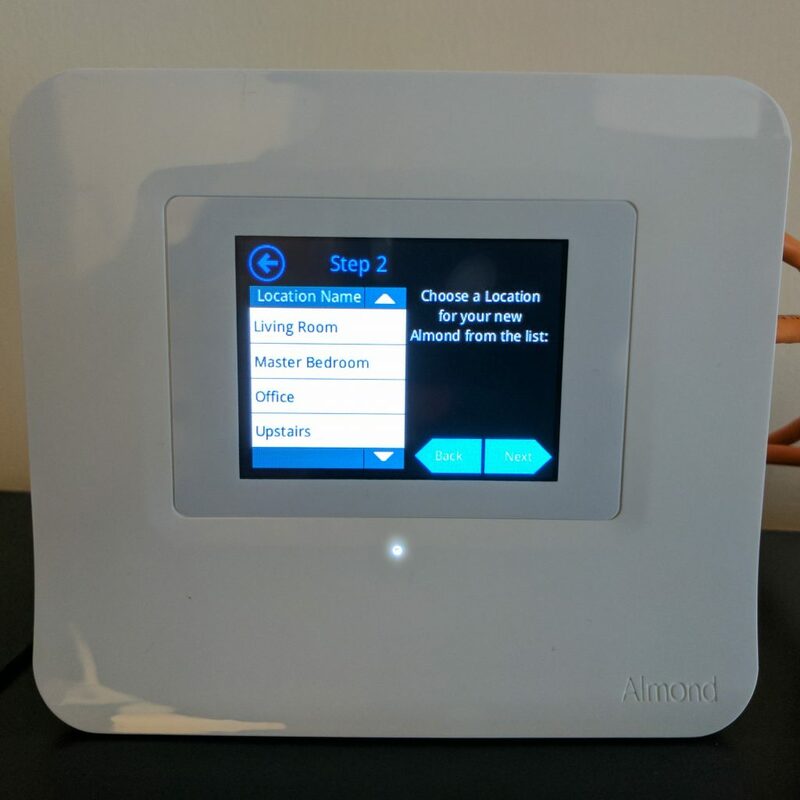 They claim the combined cost of a Wi-Fi mesh router and a smart hub is much more than the cost of the Almond 3. 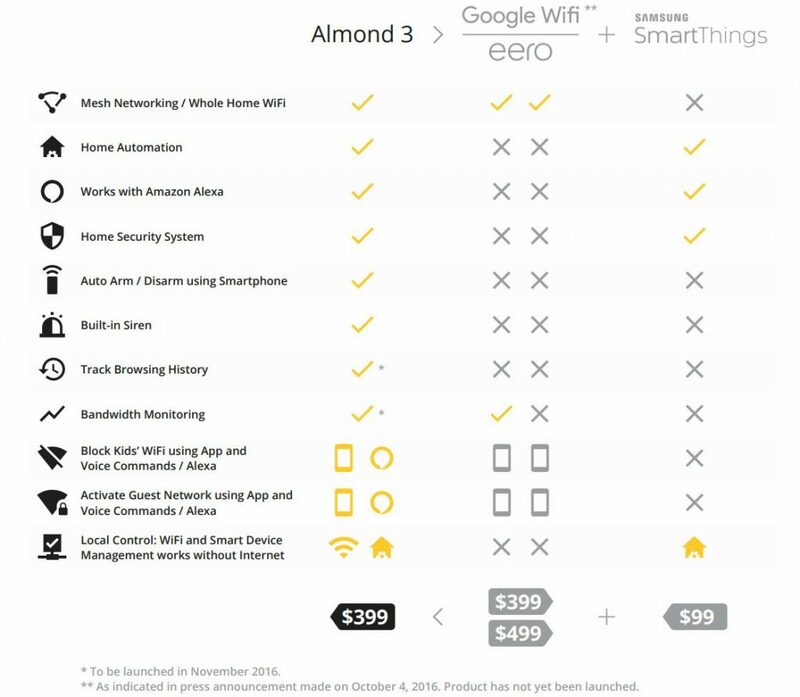 Unfortunately, that claim is only half true; while the Eero 3 pack is $499, a Google Wifi 3 pack runs $299.99. 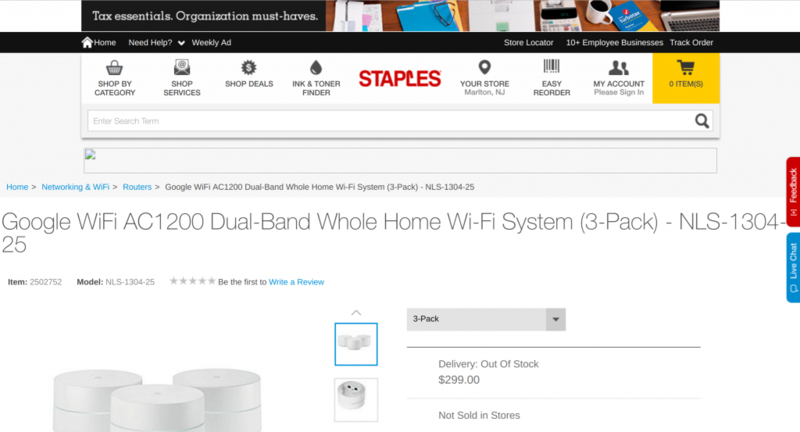 Above are screenshots from Amazon, Best Buy, and Staples to confirm this price. 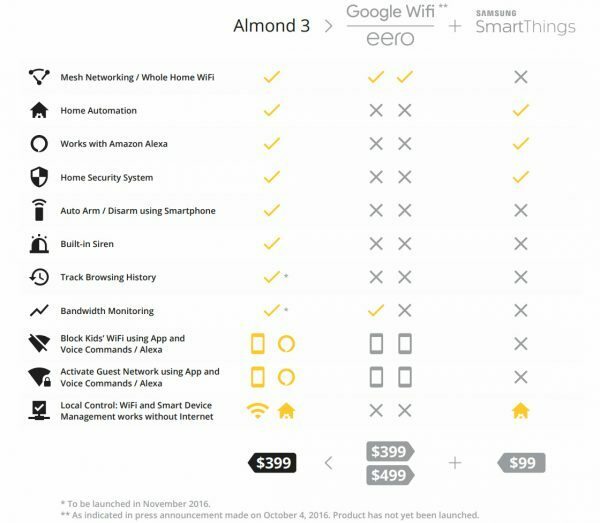 With this information in hand, you can see the cost of the Almond 3 is identical to the cost of Google Wifi plus Samsung Smarthings. This may seem like a push, but Smarthings work with both Zigbee and Z-Wave out of the box; Almond 3 requires the purchase of an additional part to work with Z-Wave. 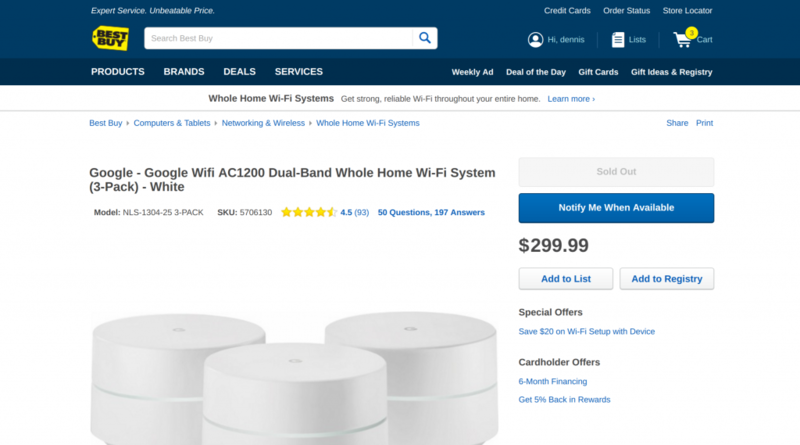 I haven’t had the chance to try Google Wifi, so I can’t say how it compares to the Almond 3; if it is comparable, it may make sense to go with Google and Samsung for added the Z-Wave function. 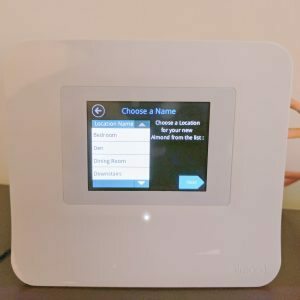 The Securifi Almond 3 is a very capable Wi-Fi mesh router and Smart Hub system; unfortunately, it’s not for me. 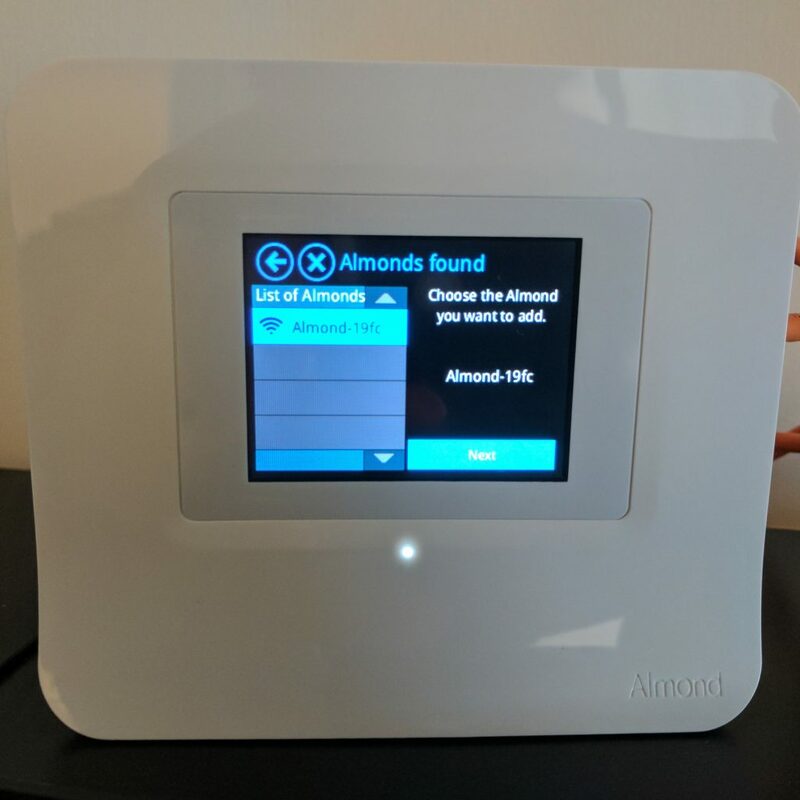 With Wi-Fi, the Almond 3 setup was time-consuming and eventually required tech support intervention. After being set up, the Almond 3 didn’t add any extra coverage to my house and I seemed to experience random, albeit brief, outages with it. 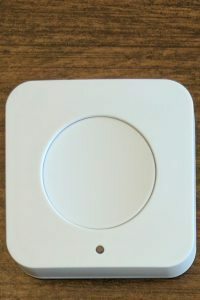 The Almond’s smart hub feature is really nice, but I already have several Z-Wave switches installed throughout my house. 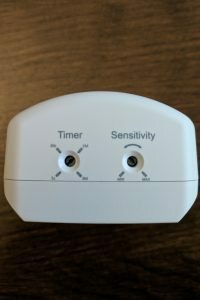 These switches work great with my Smarthings Hub, so there is no reason for me to spend the extra money on a Z-Wave dongle for the Almond 3. 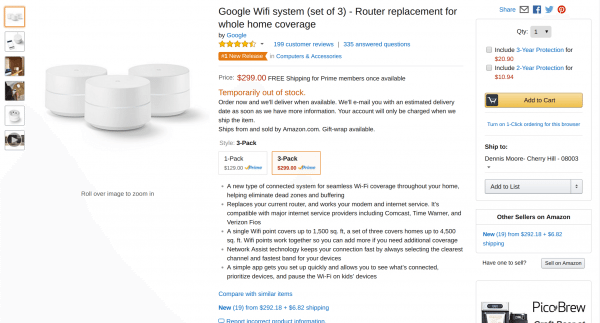 If you are in the market for a new router and a smart hub, I’d do extensive research on Google Wifi. If it seems like a good fit for what you need, I’d probably combine it with Smarthings; however, if setting up two separate systems is too much, Securifi Almond 3 is definitely a suitable system. 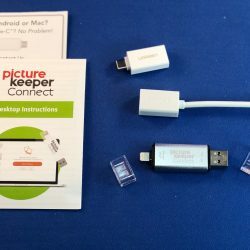 Source: The samples for this review were provided by Securifi. 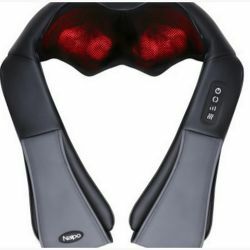 Please visit their site for more information and Amazon to order. 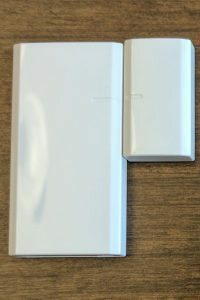 I’ve never seen a wifi extender where is not possible to change network name. 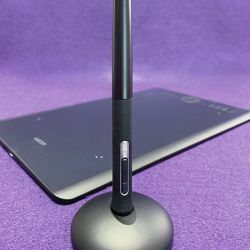 However, it is better to have different names because often devices don’t switch automatically to the stronger signal and if wifi name is the same one can’t switch manually either. Not a problem with static devices but it is with phones and tablets.